Shenzhen Railway Station is at the busy Luohu Border Crossing with Hong Kong. Shenzhen borders Hong Kong, and has convenient transportation to Hong Kong. There are five border crossings where 10,000s of people cross daily. There is also convenient transportation within Shenzhen, and between Shenzhen, Guangzhou, and other major cities in China. 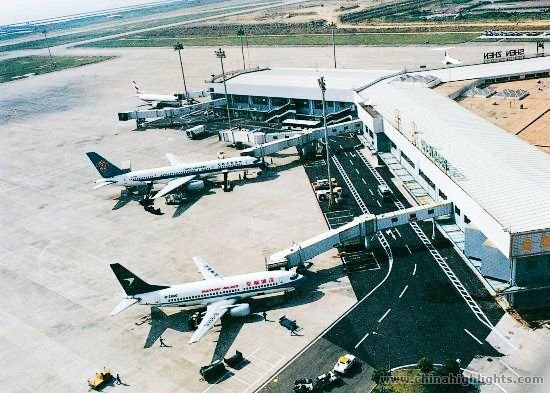 Shenzhen Bao&apos;an International Airport (深圳宝安国际机场) is a medium-sized international airport. Generally it is easier to enter China (and get to Shenzhen) via Guangzhou or Hong Kong. There is poor America coverage: 1 flight each direct to Seattle and Vancouver, but slightly better coverage for Europe and Australasia... There are about 110 domestic services, but only 14 international services that connect Shenzhen to over 100 domestic and international cities and regions. Shenzhen Airport has three terminal buildings, Terminal A, Terminal B and Terminal D (the International Terminal). Waiting Area C is located in the corridor between Terminal A and Terminal B. When driving into the airport, passengers first come to Terminal B, and then Terminal A and Terminal D in that order. Passengers can move conveniently on foot between Terminal A and Terminal B by using the long corridor on the second floor that links the two departure halls. Terminal A and Terminal B serve domestic departures and arrivals, while Terminal D only serves international departures and arrivals. Although it is 32 kilometers (about 20 miles) from the downtown area, transportation to Shenzhen Bao&apos;an International Airport is very convenient. Airport shuttle buses depart directly from the airport to the Shenzhen urban area and nearby cities. Buses and ferries departing to Hong Kong and Macau are also available. Read more about Shenzhen Airport transportation (including information about airport shuttle buses from the airport to the Shenzhen urban area, a Timetable for Intercity Buses to Nearby Cities and Ferry Transport for the Airport from Hong Kong and Macau). 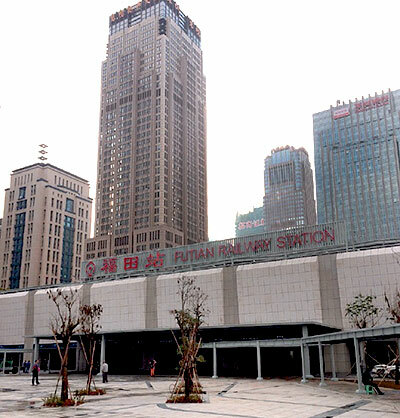 Shenzhen Futian Railway Station now connects with downtown Hong Kong in as little as 14 minutes. Information for the most popular Guangdong regional bullet trains is below. Travel times from Tsim Sha Tsui for example, including going to the station and passing through immigration, are now as short as an hour and 15 minutes compared to the sometimes 2 1/2 hour hassle and train transfers of entering through the crowded Luo Hu or Lok Ma Chau border crossings. The new G class trains connect popular tourist areas in the three cities. It is now the way tourists prefer to travel to and from Kowloon/Central to anywhere near Futian and Shenzhen North. However, beware of complying with baggage limits, and make sure your passport and visa are ready for entry. From West Kowloon Station, the Hong Kong HSR quickly and conveniently whisks people in about 16 minutes to Futian and about 19 minutes to Shenzhen North. The G train takes people to Guangzhou South from Futian in about 49 minutes and from Shenzhen North in about 30 minutes. The older D class high speed trains from Shenzhen to Guangzhou date from 2007 when the line was opened. It was one of China&apos;s first bullet train lines. These trains offer convenient service from the Shenzhen Railway Station at the Luo Hu Border Crossing to Guangzhou East Station in Tianhe and Guangzhou Station at the center of the city, and it stops also in Dongguan that is a very large city between Guangzhou and Shenzhen. 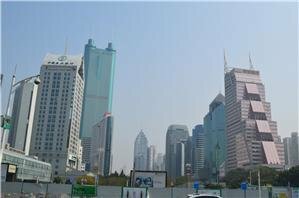 Tianhe and the adjacent Zhujiang New Town and Canton Tower areas are the areas in Guangzhou that attract most tourists. So, even though these D trains are a little slower, if you are going to these areas, it might be much faster to go by this D train instead of a G train. 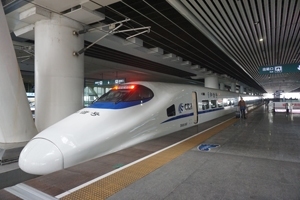 High-speed trains go to Guilin, Beijing, and dozens of other cities. Yangshuo: The G trains go direct from Shenzhen North Station to Guilin Yangshuo Station in about 2 hours and 50 minutes for about 32 USD second class. Wuhan: G trains go direct from Shenzhen North to Wuhan Station in less than 5 hours generally for about 80 USD 2nd class. Beijing: G trains go direct from Shenzhen North Station to Beijing West Station in less than 9 hours for about 147 USD second class. Shanghai: G trains go direct from Shenzhen North Station to Shanghai Hongqiao Station in about 8 hours for about 129 USD second class. Slower D trains go the distance in about 12 hours or less. See Hong Kong to Shanghai High-Speed Train. Xi&apos;an: G trains go direct from Shenzhen North Station to Xi&apos;an North Station in about 9 and a half hours for about 132 USD second class. Tourists have the option of an array of train choices they can utilize to go between Shenzhen and Guangzhou depending on where they want to go and what they want to do. Use the most convenient one for the places in you are going/coming from. 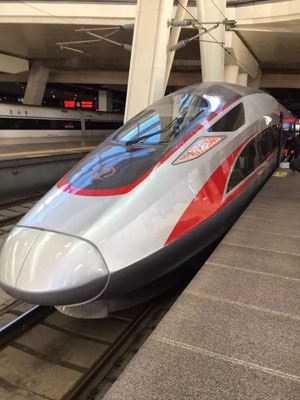 There more than 90 D and C class high speed trains running between Shenzhen and Guangzhou every day. There are also conventional T trains (special fast trains), Z trains, and the least expensive K trains (regular trains) to Guangzhou. The main conventional railway lines including long-distance overnight bed cabins leave from Shenzhen West Station primarily, but some also leave from Shenzhen Station. These are useful to save money and if you want to experience Chinese culture on the trains or if you want to sleep on trains as you travel to cities without high speed trains as yet. 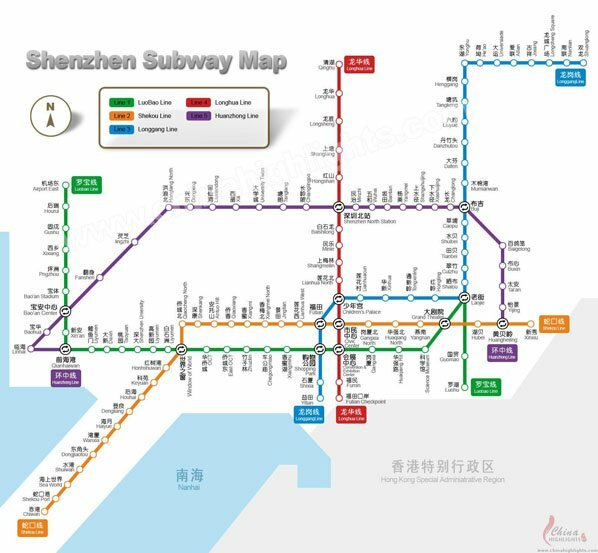 There are 8 railway stations in Shenzhen all together, but there are only four railway stations in Shenzhen that tourists will most likely use. These are Shenzhen Railway Station（深圳火车站) in the Luohu District (罗湖区), Shenzhen West Railway Station (深圳西站), Futian Railway Station (福田站), and Shenzhen North Railway Station (深圳北站). Passengers can take bus N2, N5, 7, 12, 17, 101, 102, 106, 205 or 206 to get to Shenzhen Station. Shenzhen West Railway Station is located at the junction of Yueliang Wan Avenue (月亮湾大道) and Xuefu Road (学府路), and about 20 trains arrive each day at the station. Most of these trains run from Shenzhen to Huaihua, Yueyang, Xinyang, Wuchang, Hefei and other cities. During the holidays, especially the Spring Festival holiday, the railway station is used as temporary station for many trains. Shenzhen has more than 40 coach/bus stations, and every district in Shenzhen has several long-distance bus stations. The roads link Shenzhen with many major cities in Mainland China, Hong Kong and Macau. Coaches/buses to Guangzhou, Shantou, Zhanjiang, Fuzhou, Xiamen and counties in Shenzhen are available every day. 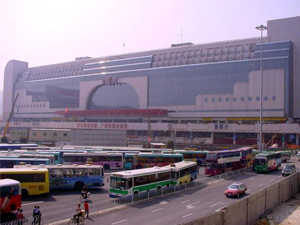 The following are several large long-distance bus stations in Shenzhen. Shenzhen has an efficient network of buses. Bus ticket prices vary from 1 yuan to 3 yuan. There are also five tourist lines that connect to all of the tourist attractions. Ticket fare: The initial price is 2 yuan for the first 4 kilometers, and after that 1 yuan is charged for each 4 km (for a travel distance between 4 km and 12 km), or 1 yuan for each 6 km (for a travel distance between 12 km and 24 km), or 1 yuan for each 8 km (for a travel distance over 8 km). Buying a subway ticket is very easy because every subway station is equiped with bilingual electronic vending machines that allow passengers to buy one-off green tokens. Passengers can change languages on the large touch screeen, and then click on the station where they want to go. The price is then displayed, and passengers then insert money at the top pf the machine (only banknotes of 5 yuan or 10 yuan are accepted, as are 1 yuan and 0.5 yuan coins). Taxis in Shenzhen, which are red, yellow or green, are plentiful on the streets. Green taxis are only available in the Special Economic Zone (Baoan District and Longgang District are not included in the zone). Some taxi drivers are rated as star-level drivers because of their good knowledge and English speaking skills. Safety: Be aware that some drivers or people in fake taxis wait especially for tourists to scam you by overcharging or giving counterfeit money. Normal fare: 10.50 RMB for the first 2 km (1.2 miles), and then 2.4 RMB per each additional kilometer. Fuel charge: 1 RMB. This is mandatory. Waiting: 0.8 RMB per minute. Night riding fee: extra 30%. Luggage fee: 0.5 RMB is charged for each luggage large than .2m³ (7 cubic feet) or heavier than 20 kilos (44 pounds). Empty return fee: If a taxi travels more than 25 kilometers or 15 miles, then there is a 30% extra added on for empty return. Taxi fares for within the Special Economic Zone: The flag down fare is 10 yuan for the first 2 kilometers (about 1.2 miles), and 2.4 yuan for each additional kilometer. From 6:00 am to 11:00 pm and for a distance above 25 kilometers (15.5 miles), 30% of the fare (removing the flag down fare) is charged as a demobilization cost. If you need the taxi to wait for you, an addition fare of 0.8 yuan per minute is charged. Taxi fares for outside the Special Economic Zone: The flag down fare for a green taxi is 6 yuan for the first 1.5 kilometers (about 0.9 miles) and that for a red and a yellow taxi is 10 yuan for the first 2 kilometers (about 1.2 miles), and 2.4 yuan for each additional kilometer. From 6:00 am to 11:00 pm and for a distance above 25 kilometers (15.5 miles), 30% of the fare (removing the flag down fare) is charged as a demobilization cost. If you need the taxi to wait for you, an additional fare of 0.8 yuan per minute is charged. Private guides: China Highlights specializes in bespoke, custom tours for individuals, families and small groups. Our tour guides can help you explore Shenzhen. Our private drivers can facilitate convenient and quick transportation. 4-Day Guangzhou and Shenzhen Essence Tour — Our most popular Shenzhen tour. Imperial and Scenic China Family Tour — You will tour Beijing, Guilin, Yangshuo, and Hong Kong. We can include Shenzhen. All our tours are modifiable. Contact us for a bespoke private tour.